Effect: This card cannot be Special Summoned. This card returns to the owner's hand during the End Phase of the turn that this card is Normal Summoned, Flip Summoned or flipped face-up. If this card inflicts Battle Damage to your opponent's Life Points, your opponent skips his/her next Battle Phase. Another horrible spirit. Since this monster is level 5, it's not going to be able to stall your opponent for very long as you're not going to be able to keep it on the field for more than a few turns. Plus the attack for a level 5 monster is horrible. There's no reason to use this card, even in a spirit deck. 1.6/5. Stay away as far as you can from this card. I have to admit, Great Long Nose has one hella' Effect. It's too bad maintaining that Effect for the span of over a turn is not an easy task. The fact that he's a Level 5, returns to your hand at the end of the turn, and can't be Special Summoned means that he's not going to be winning many tournaments. Even yesterday's CotD, Spiritual Energy Settle Machine, won't give him much of a chance at an experienced Tournament Center. That's because in a competitive environment, Magic and Trap cards that sit on the Field rarely survive for much more than a turn or two. It's very sad to see, but it's the bitter truth. Alright... Now let's look past his Effect and focus in on the ATK and DEF. More disappointments. 1900/1700 is extremely weak for a Tribute Monster. It's not going to be easy to deal much direct Life Point damage. Add in the fact he can't be searched by Witch or Sangan and he goes from casually decent, to hardly playable. Wow, this card is quite Nosey! GET IT? 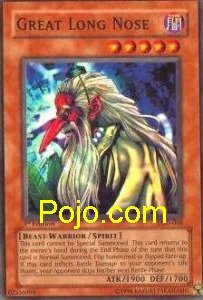 Great Long Nose has a funny name, and overall, is a card to be laughed at. The effect is really great, but paying a sacrifice for a 1900 attack monster really will take some work. First off, paying the tribute, THEN setting it up into the perfect situation where it can nail your opponent's lifepoints to get it's effect makes it even worse. I'm sorry, but this card needs to keep it's nose out of the tournament scene.